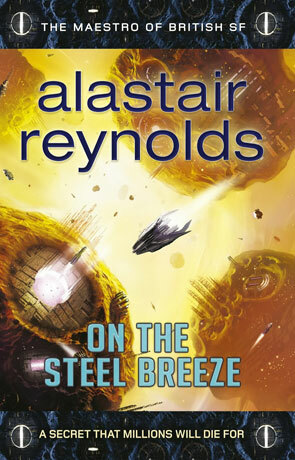 With On the Steel Breeze Alastair Reynolds has managed a little slice of futurism, how? Elephants. It seems we've been vastly under-estimating the intelligence of these gentle giants, at least most of us have - Reynolds hasn't. Recent research now suggests that Elephants are at least as intelligent as we are and often a damn site friendlier too. It appears that at some point in the future people may actually begin to realise this. Reynolds clearly has some thoughts on the subject and it's great to see these gentle giants take a bigger role in the story. The previous novel in his ambitious series begun the steps with a future that isn't as dark as most envisage and included a wealthy family, one of whom studied these magnificent creatures. On the Steel Breeze throws us forward some years after the events of Blue Remembered Earth only this time the group of Elephants we see have been "lifted". While I won't spoil the plot to say what this really means, it does create a magical feeling that harks back to the golden age of science fiction - that freedom to explore new and creative concepts. This freedom extends to humanity itself as millions of people extend out from the comfort of earth to colonise the solar system and even interstellar space by outfitting asteroids to act as generation ships. Meanwhile on our own blue planet some parts of humanity are changing, evolving into different types of homo sapien. A large part of the plot involves a group of these interstellar travelers as they journey to a new planet (Crucible) in a different solar system aboard a convoy of holoships. Here we see the author at his finest, providing an examination of how such an interstellar society may (or may not) function and the challenges they could face. The author also examines the issues that we will face as technology continues to advance apace not just in terms of adaptation but how communication, free thought and family ties change (as they are already). The plot seems to be a more tightly controlled than the last novel, there is more of a sense of Reynolds returning to his darker style with bouts of space warfare, off-screen aliens and dangerous AI. I love this vision of the future he has created, it's not all bad and still has a more positive feel than most modern science fiction novels even with a slightly darker tone than Blue Remembered Earth. Some the ideas are quite simply brilliant, such as the ability to use an artificial avatar - possibly even transferring your consciousness to such an artificial body. While this idea is of course not new it is explained and realised in a more effective, plausible way than most. This plausibility extends to humanity in the future too, there might be an incredible amount of technology where just about everyone is surveiled but governments are still imperfect, people still die and technology still fails at times. People are still driven by fear, greed, love and all the other emotions and they still make the same kind of mistakes too. On top of all this is the story itself, clever and creative with lots of twists, tense moments and a perfectly balanced structure that has a powerful, if abrupt ending. On the Steel Breeze is Reynolds on top form. Written on 17th February 2014 by Ant.